A MAIB report has been published following the tragic deaths of a mother and daughter caused by carbon monoxide poisoning on board a motor cruiser on Lake Windermere. 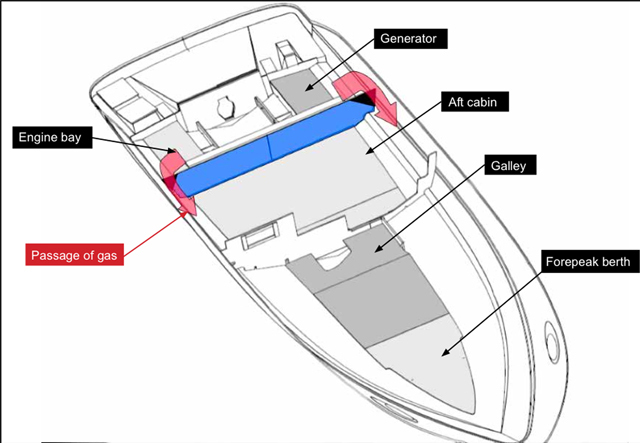 Hazards of DIY work have been highlighted by a Marine Accident Investigation Branch (MAIB) report on the investigation of the two fatalities due to carbon monoxide poisoning on board the Bayliner 285 Arniston on Windermere on 1 April 2013. The MAIB report concluded that the deceased were poisoned by the CO contained in the exhaust fumes from the portable generator installed in the engine bay. The report found that the generator’s external exhaust system had ‘failed catastrophically, causing the generator to vent directly into the engine bay instead of out of the boat’s side. During the morning of Sunday 31 March 2013, the motor cruiser Arniston was collected from Windermere Aquatics, a Bayliner dealer and service agent in Bowness, Windermere, by its owner. The owner was accompanied by his partner Kelly Webster and Kelly’s 10-year-old daughter, Lauren Thornton. He then navigated the boat on Windermere to the Ferry Nab public jetty, where his work van was parked. The group’s intention was to spend the remainder of the bank holiday weekend on board Arniston. This was their first trip and overnight stay on the boat in 2013. After Arniston had been secured alongside the public jetty, its owner removed a small “suitcase” type generator from his work van and installed it into Arniston’s engine bay. The owner had extended and modified the generator’s exhaust, which he connected to an outlet in the boat’s hull. During the evening, the group met up with other boat owners and friends at the Ferry Nab jetty to celebrate a birthday. The portable generator on board Arniston was running, and the exhaust was seen to be working as intended. The weather was very cold for the time of year so the owner and a friend warmed their hands with warm air flowing from Arniston’s side vents produced by fans in the boat’s engine bay. At about 2330, Arniston’s owner returned on board his boat, accompanied by Kelly and Lauren. He had consumed more alcohol than usual but he was not drunk. Once on board, the generator was turned off, and the owner, Kelly and Lauren went to their beds. The following morning, on 1 April, Arniston’s owner, Kelly and Lauren woke up feeling sick and suffering with headaches. Both the owner and Lauren were physically sick; the owner attributed his illness to the over-consumption of alcohol. At about 1130, Arniston’s owner moved his boat 0.75 mile to the Glebe Road public jetties, which had a number of commercial outlets, including fast-food shops, nearby. At about 1300, the owner walked to a fish and chip shop and bought lunch for the group. Kelly and Lauren stayed on the boat. The weather was fine with clear skies and light winds, but the temperature was only about 5°C. Kelly and Lauren were cold when the owner returned from the chip shop. To heat the boat’s accommodation the portable generator was started remotely using a fob, in order to power a fan heater. The fan heater had recently been purchased and could be set to either 1kW or 2kW. On this occasion it was on the 1kW setting. Shortly after the group ate their lunch, the owner fell asleep at the table. When he awoke, he felt very unwell; his fingers were numb and he had pains in his chest. The owner was extremely disorientated and was not fully conscious. He struggled onto the upper deck and laid down on the seating area to recover. After an unknown period of time the owner started to feel better and he made his way back down below. The door to the aft cabin was ajar, Kelly and Lauren were both inside and appeared to be unconscious. Neither Kelly nor her daughter responded to the owner’s attempts to wake them. • The silencer fitted to the generator’s modified exhaust system had completely detached at both ends and was lying on the engine bay deck. • ‘Scorch’ marks and evidence of solder ‘splash’ were found on the heat resistant bulkhead lining adjacent to the exhaust outlet pipe on the generator. • The breaker switch on the electrical distribution panel, controlling the engine bay fans and the battery charger, was in the ‘off’ position. • Arniston was fitted with two SAFE-T-ALERT CO alarms, model number 60-541. One located on the deck head in the aft cabin and the other fixed on the deck head above the dinette table. Information shown on both alarms indicated that they had been due for renewal in 2005 and had been date-stamped as being manufactured or fitted on October 8 2002. • Both CO alarms had been disconnected from the power supply and were not fitted with internal batteries. • Arniston was also fitted with several stickers that warned of the hazards of CO. The stickers were required in order for the boat to comply with the NMMA build standard in the USA. Arniston’s owner was a qualified plumber. 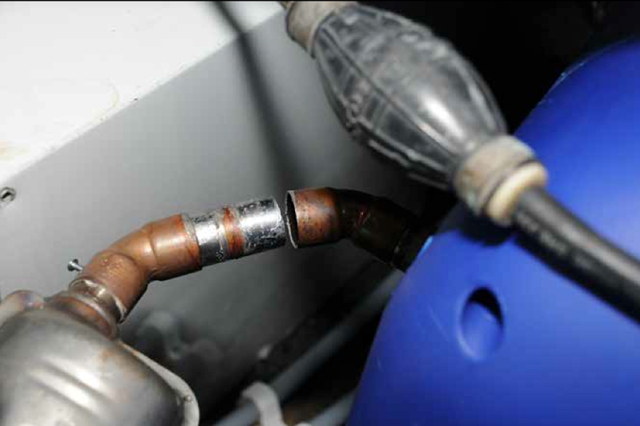 Therefore, not surprisingly, the soldered joints on the generator exhaust system were of an adequate standard for use in a hot water system. Also, the owner had tested the exhaust system on the generator after its assembly. However, the test was not conducted with the generator under load. It did not produce the temperatures needed to identify that the use of soft solder and plumbers’ fittings were totally inappropriate in the generator exhaust system. Consequently, the exhaust fittings did not fail during the test, which gave the owner misplaced confidence in his work. 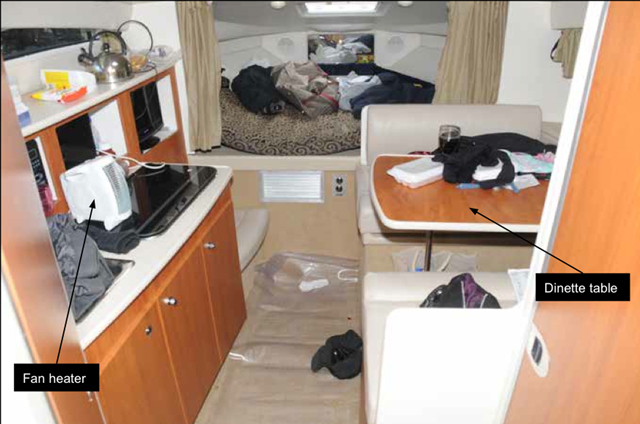 During the course of the MAIB investigation into this accident, it was found that a number of other boat owners on Windermere had also installed portable generators in enclosed spaces. Many had installed the generators themselves. 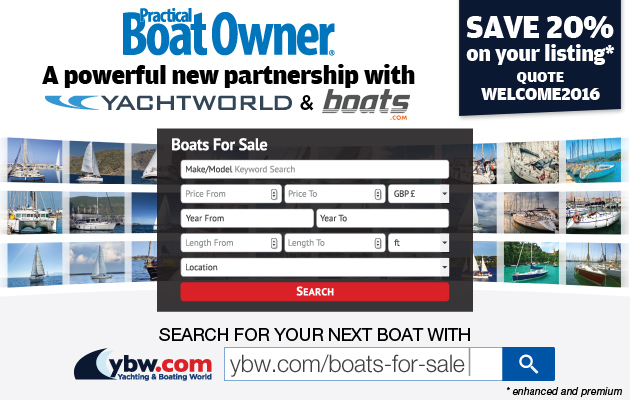 Do-it-yourself (DIY) work is very popular in the marine leisure sector and is seen as an enjoyable part of boat ownership. It also helps to reduce the costs of running and maintaining a boat. Nonetheless, there are numerous systems on board boats that, regardless of a boat owner’s engineering and mechanical skills, should only be installed, maintained or modified by a qualified marine engineer. In such situations, marine engineers should also follow equipment manufacturers’ instructions and use the correct tools and materials. The financial cost of using marine engineers to complete safety-critical work is inevitably more expensive than the cost of ‘DIY’. However, where safety critical systems are concerned such expenditure should be factored in to the cost of boat ownership. The MAIB report concludes that the deceased were poisoned by the CO contained in the exhaust fumes from the portable generator installed in the engine bay. The MAIB have made recommendations to the Boat Safety Scheme, Maritime and Coastguard Agency, Royal Yachting Association, British Marine Federation, Council of Gas Detection and Environmental Monitoring and the Association of Inland Navigation Authorities, to build on current initiatives to raise the awareness of the leisure boating community of the dangers of CO and the importance of fitting carbon monoxide alarms. Chairman of the BSS management committee Vince Moran said: ‘The report shines a bright light on the risk from carbon monoxide poisoning in boats and the challenges there are to tackle the issue. ‘We owe it to everybody affected over the years, including victims, friends and families, to intensify our efforts to get the message out. 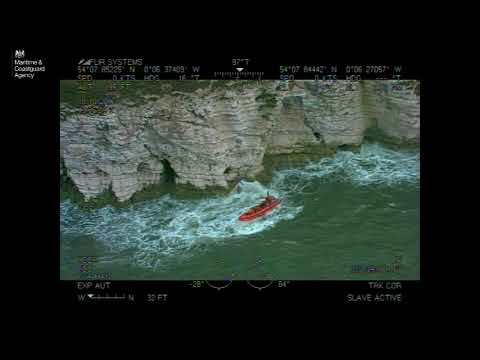 ‘If everybody plays a part, skippers, crews, the boating industry, navigation authorities and the Boat Safety Scheme, it will be much more likely that such terrible events will cease. ‘We have already begun a dialogue with the Lake District National Park Authority and have offered our support in their consideration of the Chief Inspector’s recommendation. ‘We will work closely with the Authority to see what action can be undertaken to reduce the likelihood of carbon monoxide poisoning incidents in the future and we are confident that adoption of the BSS by LDNP, as recommended by the MAIB, has the potential to also reduce the number of incidents of boat fires and explosions’. 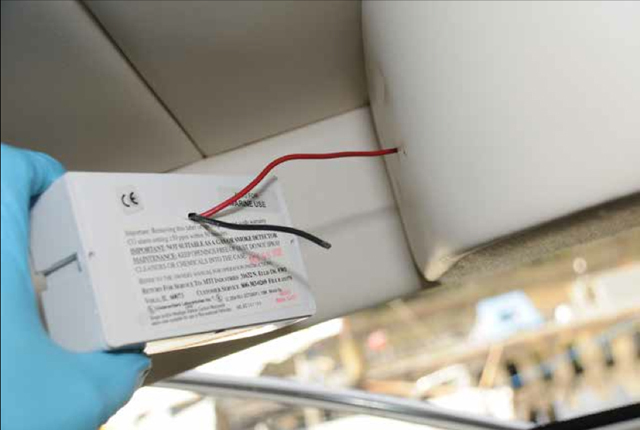 The MAIB report recognised that BSS boat examinations help identify potentially dangerous CO-emitting installations, highlight the risk and trigger key warnings with relevant recommendations for the boat owners. why it is critical as a lifesaving backstop, to install CO alarms certified as meeting the latest standards, currently BS EN 50291-2, and have a routine for pressing the test button. Underpinning these key points, Graham Watts, Boat Safety Scheme manager explained what CO is and how it affects people: ‘Appliance fuels need the right amount of oxygen to burn safely. Without enough air, the burn process is inefficient and the by-product changes from carbon dioxide to carbon monoxide. ‘Once in the lungs, carbon monoxide will replace the oxygen in your bloodstream that is vital to keep life going. ‘CO cannot be seen, smelt or felt. It has taken the lives of boaters even in moderate concentrations. If it starts to leach into a cabin, crew members can succumb before they realise there is a problem. The risk is even more serious when people are asleep. ‘The early symptoms of poisoning are similar to flu or food poisoning, and can include headaches, nausea and dizziness. The Scheme’s belt and braces advice is to fit a CO alarm approved as meeting BS EN 50291-2 as these are best suited for boats. Alarms need testing when first boarding the boat and weekly when staying aboard. Batteries should be changed if they do not work when tested and a new alarm must be fitted if the ‘replace by’ date marked on the alarm has passed. The advice is to have one in the cabin or living quarters placed just below ceiling or deck-head height. When asleep, for best protection, have an alarm in the breathing zone i.e. around the bed-head area.